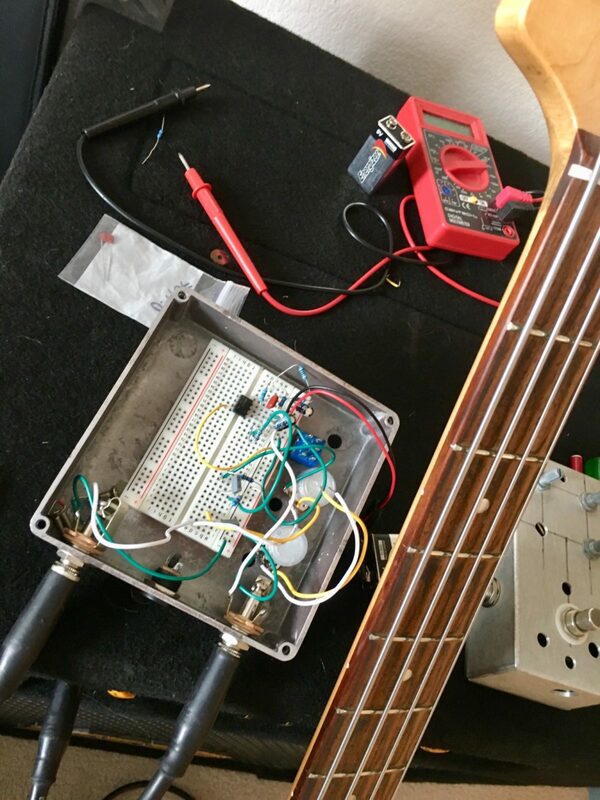 I set up my breadboard in an old stomp box enclosure I had laying around and populated the board with a opamp booster circuit I pulled off of Jack Orman’s site. It’s feeding a modded Big Muff Pi tone stack I took from the Kreuzer preamp. I was really hoping that I would lose interest in this – I don’t know jack about circuits and electronics and I really have no business trying to design an onboard preamp. The only problem is, so far it sounds really good! I actually like it more than I like the MM pre I’ve been using. I gotta bring the gain down a little bit, pick the right sized input cap and get the LPF part of the tone stack to attenuate more highs, but that’s it, really. I should probably stick a buffer in there somewhere as well. After rocking out with the opamp version of the boost section for a few days, I built a JFET version. Here’s my thoughts. Both preamps are really simple boosts directly feeding a BigMuff tone stack. The opamp version sounded great. It had a really muscular sound that knocked my socks off. On top of that, it really opened up the highs and upper mids that really brought the bass to life in a really cool way. Not harsh, but bright and really present sounding. Overall, it gave my little pickup a really forceful vibe that would have no problem supporting a band and a rhythm section. The downside is that the gain is really intense – there’s a really fine line between driving the amp to the point of clipping and driving it to the point of sounding bumpin’. That’s just a matter of fine tuning one resistor. The JFET version also sounds great, but it’s a different beast altogether. The JFET has a fatter and warmer sound. It’s still bright, but the highs are more pleasantly rounded and has less “bite” than the opamp version. The JFET is not a tight in the low end, but that’s not a bad thing. It also doesn’t clip like the opamp version, but it drives in it’s own way. I hate using the word “vintage” but for the sake of coming up with contrasting descriptions, I’ll say it’s kind of akin to “vintage” vs “modern”. I may be imagining these differences, so I will test the JFET version for a few days and switch back to the opamp. Since both of these boosts consist of maybe 5-6 parts tops, I am putting forth the idea of installing a switch between the two and installing both in the bass. It would be a really simple wiring job – it would literally be choosing between one short signal path and another. I don’t know if that’s a crazy idea or not. The EQ section is really cool and functional. It’s kind of like a “tilt” EQ that really places the emphasis on either the lows or the highs, and it’s easy to just twist in a sound with just the turn of one knob. That, combined with ability to really fine tune the amount of mids coming out of the preamp via use of the Duncan Tone Stack Calculator it would also be conceivable to put a little “mid-switch” that either swapped out caps or placed an extra cap in parallel. Because of the placement, the pickup puts out a ton of mids, I could back the off mids drastically and have a lot tonal options coming out of one pickup. I’m also contemplating building in a buffer circuit, although I don’t know enough to know if it’s even necessary. According to the notes on the AMZ site, there’s an implication that R1 sets the impedance at 1M – which, from what I kind of understand, is the job that the buffer is supposed to do. So, does it make sense to set the impedance twice?